In the early years Kathy frequently submitted her wines for review. It was a necessity as a new kid on the block, but it was disheartening to see the inconsistency of reviews of the same wine – rave commentary by one and mediocre reception by another. After judging years of wine competitions, Kathy knows first hand that “blind” tastings are a matter of interpretation and there is an amazing amount of bargaining that drives awards. It is difficult for us to embrace solo opinions and negotiated reviews, often awarded by unqualified judges and skewed rules. So in reaction, today Kathy encourages you to be the judge. She hopes you will experiment with your palate and discover new and exciting flavors without the influence of slanted press. We present you with a challenge – to indulge in our wines and enjoy the beauty of their textures and ageability. Our best reviews are testimonials from wine drinkers who have discovered our wines and tell us about their experience rather than just rating them with number. Check out our testimonials page and leave your own! Sauvignon blanc, a varietal with roots in both the Loire Valley and Bordeaux regions of France, had an auspicious beginning in California compared to the more-established chardonnay. It then received a boost after Robert Mondavi changed the name of his sauvignon blanc to Fume’Blanc, a marketing ploy with obvious references to Pouilly Fume’ in the Loire Valley. Sauvignon Blanc has also adapted well to the expanded “New World” wine regions like New Zealand, Chile, South Africa, and Washington State. During a recent visit to the Pouilly Fume’ region, I enjoyed a special release with local winemaker, Clement Marchand, whose family has been making wine at their village site since 1650. The Clement Marchand “Kimmeridgian” Pouilly Fume’ 2016 ($35), named after a local fossil-laden soil, had a round texture and creamy mouthfeel with nice stone fruits on the palate. All wines from Pouilly Fume’ are exclusively sauvignon blanc and, along with nearby Sancerre, located on a promontory to the other side of the river, are identified by region, not varietal. The local terroir, with moderate temperatures and soils abundant in limestone, produces a dry, crisp, palate-cleansing wine with citrus flavors and their trademark “smoky, gun- flint” aromas. Sauvignon blanc is still a major Bordeaux grape, whether it is blended with semillon, infected with the Botrytis cinerea fungus in the southern regions of Barsac and Sauternes or sitting on its laurels as the mother of cabernet sauvignon. Few people know that cabernet franc and sauvignon blanc parented one of the most popular and abundantly planted varietals on the planet. Sauternes and Barsac are known, by name, for producing the world’s finest and most expensive dessert wines. Arguably, the best Sauternes wine available today is the Chateau d’Yquem 2005 ($550), a Premier Cru Superieur blend of semillon (75 percent) and sauvignon blanc (25 percent) that is a sensory treat with fresh vanilla aromas and rich flavors of creme brûlée and gingerbread. Ironically, the first sauvignon blanc cuttings that arrived in California, during the late 1800s, came from the Sauternes vineyards of Chateau d’Yquem. They have flourished here, adapting to both warm and cooler climates. The two best examples of California sauvignon blanc, in my mind, are both produced by women, one from the cool Russian River Valley and the other from the warm Santa Ynez Valley in north Santa Barbara County. Merry Edwards is an icon in the wine industry, producing fine pinot noir, chardonnay and sauvignon blanc from vineyards near Sebastopol. As with previous vintages, the 2017 Merry Edwards Sauvignon Blanc Russian River Valley ($36), with added Sauvignon Musque from Sancerre, exhibits spirited floral aromas, a creamy mouthfeel with herbal flavors and some zest on the finish. Ms. Edwards recently semi-retired and sold Merry Edwards Cellars to respected Anderson Valley sparkling wine producer, Roederer Estate. Heidi von der Mehden, the new winemaker and staff will be retained and Edwards will consult for a year so, I anticipate being able to enjoy her sauvignon blanc in the future. Winemaker Kathy Joseph of Fiddlehead Cellars in Lompoc speaks passionately of pushing pinot noir and sauvignon blanc toward their potential, either paired with food or not. Of her five sauvignon blanc releases, my favorite, as with other vintages, is the 2018 Fiddlehead Sauvignon Blanc “Goosebury” Happy Canyon of Santa Barbara ($38), sourced from warmer climate and described by Joseph as “zingy like a New Zealand wine, juxtaposed with the elegance of a Sancerre.” I find it to be a perfect pair with fresh scallops or chèvre. Sauvignon blanc has become so prominent in the southern hemisphere that the term “New Zealand-style” is synonymous with aromatic wines and flavors of fresh cut grass and grapefruit. Each vintage, one of the most popular sauvignon blanc wines from New Zealand is the 2018 Cloudy Bay Sauvignon Blanc Marlborough ($30) that maintains the “green characteristics” while adding a touch of tropical fruit flavors. Boasting recent high ratings, the 2016 Greywacke “Wild Sauvignon” Sauvignon Blanc Marlborough ($30) has an austere savory character that doesn’t sacrifice complexity in the flavor profile. Sauvignon blanc, no longer an alternative white wine, is charging into the future with a global presence that highlights expressive bouquets, intricate flavors and the textures in a wine that belongs at the dinner table. SANTA YNEZ VALLEY — The 2018 harvest marks the 30th anniversary of Fiddlehead Cellars, a winery in Santa Ynez Valley owned by winemaker and head fiddle, Kathy Joseph. Thirty years is a significant marker in the California wine industry, especially for Santa Barbara County, where post-Prohibition commercial plantings date only to 1960. ​But when you meet Kathy Joseph, you understand. Joseph is as energetic, passionate and driven. Since Day 1, she has been hands-on with all facets of the business, from in the vineyard to the winemaking to the marketing and selling. She holds the titles proprietor, winemaker, grape herder and head fiddle. Fiddlehead Cellars is her baby and it has been an exciting 30-year journey. No matter where the day takes young wine drinkers, no trip to the Wine Ghetto is complete without a tasting session at Fiddlehead Cellars and a chat with winemaker Kathy Joseph. She has the distinction of being one of the original “settlers” in the complex (arriving in 2003), having a full winery (and not just a tasting room) located there, and working on her 30th vintages of pinot noir and sauvignon blanc. 2000s were also available for purchase. second home in Davis, California. graduated from UC Davis with a degree in enology and viticulture. In 1989, she created a winery like no other. Farmer. Winemaker. Scientist. Mentor. Adventurer. Entrepreneur. Kathy Joseph could have any of those labels placed on her, but any one of them would capture just a part of her character. She's the complete package, like the wines she crafts at Fiddlehead Cellars. Kathy's decision making acumen is fascinating. Thirty years ago, she chose to champion Santa Barbara County and Willamette Valley wines for Fiddlehead Cellars. She picked Pinot Noir and Sauvignon Blanc as her label's varietals. She then selected perfect spots to grow those grapes. That prescience would be remarkable today, but it's astounding based on the paucity of information available back then. Remember, this was pre-Google. The postSideways Pinot Noir frenzy wouldn't occur for another fifteen years. Kathy Joseph followed her palate. She studied biology and microbiology at the University of Wisconsin and moved to Chicago’s Lincoln Park neighborhood, where a career in medicine beckoned. But, Joseph wanted to do something different. The former pre-med student knew how to do research, a skill that paid off as she transitioned into a career in wine. One bottle set her on a 30-year odyssey that is still active. After she’d tasted a 1974 Sanford Pinot Noir from the Sanford and Benedict Vineyard, she knew where she wanted to go. A bold move into what was, at the time, virtually undiscovered country in Santa Barbara County paid off and will be marked by Fiddlefest 2.0, Fiddlehead’s 30th anniversary celebration, to be held from 1 to 4 p.m. Saturday, July 28, at the Fiddlestix Vineyard on Mile Marker 7.28 of Santa Rosa Road in Lompoc, California. General admission tickets cost $90. More than 30 wines will be poured as Joseph dips into her extensive library to open her “wow wines” for the sixth installment of Fiddlefest. There’s a symmetrical trifecta as Fiddlefest takes place on mile marker 7.28 on 7/28 and will also feature a donation of $7.28 from every ticket sold to the Women’s Fund of Northern Santa Barbara County. Visit www.fiddleheadcellars.com for information on tickets, other ways to celebrate and area lodging options. Fog had just started to burn off and the summer sun finally began to win out in its daily battle with the Santa Rita Hills coastal influence when Joseph picked up the phone for a recent interview. Located on the north side of a tight east-west running valley, Fiddlehead is in a region with climate and soil that make for a Pinot Noir paradise. To forgo a potentially stable, lucrative career in medicine for one in wine didn’t deter Joseph. As the presence of women in the wine industry continues to grow, Joseph and her female colleagues continue to be outnumbered by their male counterparts. 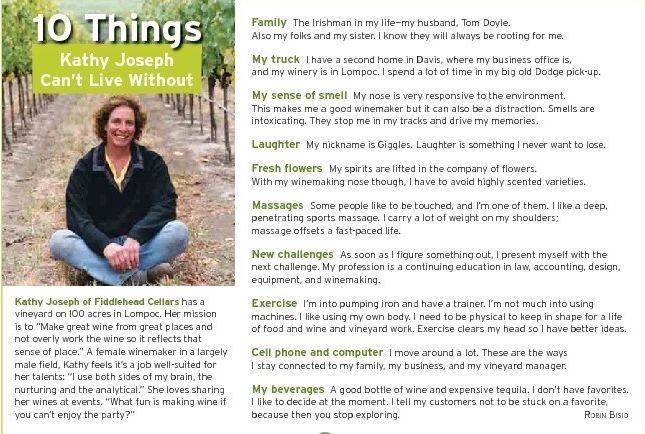 After graduate studies in enology and viticulture at the University of California, Davis, Joseph worked at wineries of all sizes and familiarized herself with all types of equipment. Without a large fortune to purchase expensive properties, Joseph pulled off a stroke of genius when she purchased a 133-acre flower farm in 1996 in what would become the Sta. Rita Hills AVA in 2001. She also makes wines from Happy Canyon, a warmer AVA at the eastern edge of the Santa Ynez Valley AVA and Oregon’s Willamette Valley. They were atypical places that grew to prominence, in part because of her hard work in the vineyard and cellar. “Pinot Noir and Sauvignon Blanc were underdog varietals,” Joseph said. “Working in an area that at the time wasn’t as developed, I believed in my heart that I could grow a brand and help the areas grow up. Because Joseph said she’s always lived by the mantra that “there is more to learn,” her most recent venture is a planting of Grüner Veltliner. A white varietal prominent for the way it shows in Hungary and small pockets of Germany, Joseph has it in her cool climate vineyards. Planted at 400 feet above sea level and just 10 miles from the Pacific Ocean, the pioneering spirit still burns bright in Joseph with her most recent bottling. There will be a crowd at Fiddlefest 2.0; Joseph is a winemaker worth following. ​• James Nokes writes a bi-weekly wine column for the Daily Chronicle. He’s been tasting, touring and collecting in the wine world for several years. Contact him at news@daily-chronicle.com. Join Fiddlehead Cellars on Saturday, July 28 from 1-4 p.m. in celebrating its 30thAnniversary. The event will be held at Fiddlestix Vineyard in Sta. Rita Hills (Mile Marker 7.28 Santa Rosa Rd., Lompoc). To celebrate Fiddlehead Cellar’s Anniversary, Owner/Winemaker Kathy Joseph is opening the Fiddlestix barn doors to Drink ‘728’ on 7/28 at 7.28. The event marks the 6th Annual “Drink 728 on 7/28,” but this year guests will have the opportunity to taste the wine in the place where it grows. Throughout the event, the popping and pouring of over 30 vintage wines will occur. “30 years is a long haul in today’s competitive environment. I remain true to my quest to master place-driven wines with elegance. And I am one of the few who relishes at showing off, without goofy attitude, years of vintages with bottle age. Please come experience and taste the place,” expresses Joseph. She was mentored by five exceptional winemakers on the North Coast and studied Enology and Viticulture at the University of California, Davis at the graduate level. In 1989, Joseph took a leap of faith and created a winery like no other. She is motivated to think outside the box and sell, market, and promote in her own unique way. Los Angeles, CA – Fiddlehead Cellars will be celebrating its 30th Anniversary on July 28th at their Fiddlestix Vineyard in the Sta. Rita Hills. The barn doors will open for Fiddle Fest 2.0 as guests are invited to taste through Fiddlehead’s history. Many older vintages of wine will be opened, including the prized Doyle Pinot Noir dating back to 2002. Kathy started Fiddlehead Cellars 30 years ago when there were very few women who owned wineries and very few women winemakers. 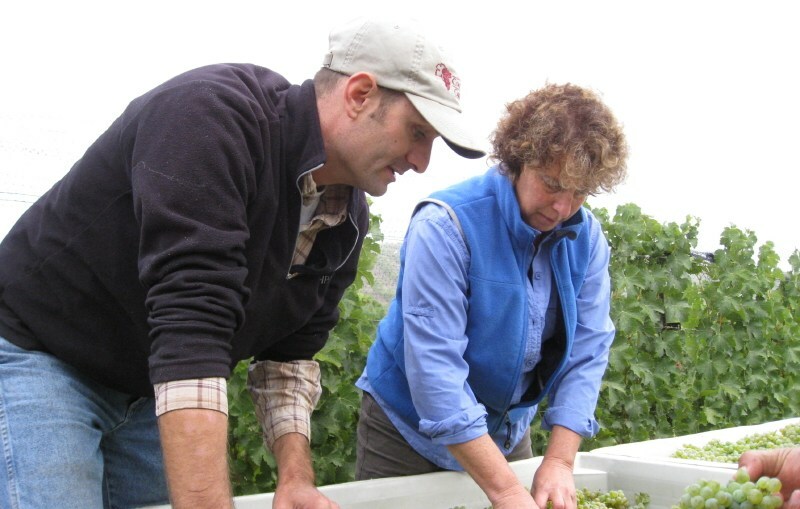 At the time, very few people were making high-end, quality Pinot Noir or Sauvignon Blanc and Kathy focused her efforts on capturing the pure essence of these two distinguished grape varietals. She also began producing Rosé in 2004, before it was trendy, and is now leading the way on growing cool climate Grüner Veltliner. “30 years is a long haul in today’s competitive environment. I remain true to my quest to master place-driven wines with elegance. And I am one of the few who relishes at showing off, without goofy attitude, years of vintages with bottle age. Please come experience and taste the place,” expressed Kathy Joseph. Kathy was drawn to Santa Barbara County, as well as the Willamette Valley, well before the sub-appellations came into play. Her quest was simple. Besides a lesser important desire to satisfy her own palate, her intent was to incorporate European beauty into these domestically grown varietals by working with grapes grown in the right place and wines managed with respect in the cellar. Her estate vineyard, Fiddlestix, is located in a narrow slot of cool climate Santa Rita Hills AVA at mile marker 7.28 on Santa Rosa Road. It is a gorgeous piece of Pinot Noir paradise and is touted as one of the best in the Sta. Rita Hills. One of the Pinot Noirs produced by Fiddlehead Cellars, “Seven Twenty Eight” is named after the mile marker. To celebrate Fiddlehead Cellar’s 30th Anniversary, Kathy is opening the Fiddlestix barn doors to Drink ‘728’ on 7/28 at 7.28. The event will mark the 6th Annual “Drink 728 on 7/28” but this year guests can taste the wine in the place where it is grown. Extensive verticals of all Fiddlehead wines will be available to taste. For more information about Fiddle Fest 2.0, contact Kathy Joseph at fiddlenews@fiddleheadcellars.com. Fiddlehead Cellars, established in 1989, is located in the Sta. Rita Hills in Santa Barbara County. Producing age-worthy wines of texture, elegance and expression of place, Fiddlehead Cellars produces Pinot Noir, Grüner Veltliner and Sauvignon Blanc. Fiddlehead Cellars produces 5000 cases of wine annually. As the Sta. Rita Hills AVA’s reputation for world-class pinot noirs and chardonnays grows, Lompoc has emerged as California’s most unlikely wine country town. Best known for its proximity to Vandenberg Air Force Base and a federal penitentiary (where the likes of rock-and-roll god Chuck Berry and fallen Watergate figure H.R. Haldeman did their time), Lompoc had only scattered vineyards on its outskirts back in the 1980s. Nobody paid them much mind, even though the Lompoc Valley’s longtime identity as the self-proclaimed “flower seed capital of the world” was slipping away as growers moved to cheaper locations in places like Chile and Zimbabwe. Local farmers never thought that grapes would thrive in the cool, windswept valleys near town, but in 2001, a 30,720-acre area from Lompoc east to Buellton earned designation as what is now the Sta. Rita Hills AVA (the odd spelling is a compromise to avoid confusion with a region in Chile). Now Lompoc’s endlessly mispronounced name (Lom-POKE, for the record) appears on the labels of coveted bottles produced in the surprising wine region on the edge of town. A roughly 34-mile loop from Buellton to Lompoc and back again easily covers the Santa Rita Hills region. Outside Lompoc along Highway 246, Tuscan-style Melville Vineyards & Winery wouldn’t be out of place in Napa or Sonoma, while Babcock Winery & Vineyards’ vintages include not only wines but also classic vinyl in its Soulstruck Lounge. Mostly unstriped as it parallels the Santa Ynez River southeast of Lompoc, Santa Rosa Road leads to several wineries in a classic California farming valley. If the curves don’t slow you down, a tractor probably will. Taste of Sta. Rita Hills: Your first stop should be this tasting room, which features top boutique wineries in the appellation as well as selections from owners Jeni and Antonio Moretti’s operation—just 400 cases annually. LaMontagne Winery: Producing fewer than 1,000 cases a year, owner Kimberly Smith, who became a winemaker after a health crisis, has won acclaim for her single-clone, single-vineyard pinot noirs from the Santa Rita Hills. Fiddlehead Cellars: Known for pinot noir made from grapes grown at her estate vineyard off Santa Rosa Road (where she also happens to live), Kathy Joseph is among the most celebrated winemakers in the region. Rose petals, iron, turned earth, slate, hot dirt and black plums show on the nose of this bottling by Kathy Joseph. Thick flavors of black cherry paste, rose hips, rose water and a floral potpourri blend into turned soil, black tea and juniper notes. Firm tannins indicate this will age well, but still needs a little time to reach full potential. -M.K. ​People went wild for the Los Angeles Zoo’s Sustainable Wine and Dinner Series last year. The Thursday night series continues with “Raptors and Reptiles” with Ramona Ranch Vineyard and Winery on April 26, “Native and Natural” with Robert Hall Winery from Paso Robles on May 31, and “For the Generations” with Ancient Peaks Winery from Santa Margarita on June 28. Share ArticleThough hard evidence is elusive, anecdotally, it does seem that Santa Barbara County boasts more women winemakers per capita than anywhere else in the state, if not the world. It’s a long tradition here, harking way back to Doña Marcelina Dominguez and her 1800s La Parra Grande grapevine in Montecito, and then reenergizing in the modern movement with Lane Tanner, Kris Curran, Kathy Joseph, and so forth. One of the newer faces on that scene in Gretchen Voelcker, who grew up on a family farm in Philadelphia but found wine while living in Brussels during high school. School at Georgetown and then UC Santa Cruz delivered her into the wine business. “I really saw wine as an opportunity to express my creative side and still be in touch with the sciences,” said Voelcker, who started at Rideau in 2012 and is now assistant winemaker. She also worked with Ryan Roark, who taught her the garagiste side of small-batch winemaking and encouraged her to start her own brand. First called Moon Unit Wines (a childhood nickname) ​— ​until Moon Unit Zappa sent a cease-and-desist letter ​— ​the brand is now called Luna Hart, a reference to both the moon and a stag. “I wanted something that was both masculine and feminine representing the energy that I put into my work,” explained Voelcker, who’s now making about 250 cases a year with hopes to grow to 1,000. She’s making cabernet franc, sauvignon blanc, and a white blend. “I like to tinker a lot, so that was an opportunity to tinker with white wines and challenge to see what would pair well with spicy and Asian foods,” she explained. She’s also excited to be adding gruner veltliner from Kathy Joseph’s Fiddlestix Vineyard. Along with Joseph and nearly two dozen other female vintners, Voelcker is taking part in the second annual Women Winemakers Dinner on Thursday, March 8, 5:30-9 p.m., at K’Syrah Catering &Events in Solvang. The event, which coincides with International Women’s Day, is a fundraiser for the Women’s Fund of Northern Santa Barbara County. Tix are $50 for wine and apps, or $125 for the four-course sit-down dinner. See womenswine makerdinner.eventbrite.com. Pushing Proper PinotA few Mondays ago, South African–raised winemaker Ernst Storm of Storm Wines gathered a group of “progressive” pinot noir makers to Presqu’ile Winery east of Orcutt to taste wines and talk shop. By “progressive,” Storm meant colleagues who focused on the less-extracted, fresher side of the grape, usually without much new oak usage (which could mask the fruit flavors) but with a certain amount of whole-cluster fermentation (which can add earthy spice) in the mix. Each winemaker brought two single-vineyard wines from their brands, which included Tatomer, Presqu’ile, LaBarge, Piro, Chanin/Lutum, Scar of the Sea, Whitcraft, Bien Nacido/Solomon Hills, Dragonette, Dierberg, and Storm. I’d blind-tasted almost all of the wines before, and scored them all quite highly ​— ​the combination of bright fruit, zesty acidity, and herbal intrigue is fascinating and refreshing, so much that I have a hard time keeping these brands in my cellar. Search out these wines and more at World of Pinot Noir this weekend at The Ritz-Carlton Bacara. I’m hosting a panel of some Central Coast favorites on Friday, including Dierberg along with Big Basin from the Santa Cruz Mountains, Stephen Ross from Edna Valley, and our own legend Ken Brown, among others. See wopn.com for tickets, including the truly iconic dinners. Coming back to women winemakers with vision, Karen Steinwachs at Buttonwood broke new enological ground in 2016 when she combined pungent hops with her zesty sauvignon blanc to create Hop On. The latest vintage is out now, and this one features hops grown by Pacific Valley Hops near Lompoc. It’s even more hoppy than the last and even hoppier than most beers, as the still-white-wine base really captures the purity of the piney buds while also conveying their tropical, pineapple-ish characteristics. So it’s perfect for hopheads who crave that bite but maybe just worth a sip for those who prefer their wines straight. See buttonwoodwinery.com. At first glance it’s just not something you would think might go together, but I saw it in a buffet line and had to try it. Immediately, I fell in love! This is a feast of protein; and yes, avocados do grow in Southeast Asia. With a local white wine from the Lompoc Wine Ghetto, an often-overlooked production area in Santa Barbara County, this pairing should lift off like a SpaceX Falcon Heavy, soaring above all expectations and sending you around the world with exotic cuisine. Heat a cast iron skillet over high heat. Meanwhile, combine sesame and peanut oil in a medium mixing bowl and the 5 spices in a small cup. Coat tuna steaks with the oil, and then rub in combined spices. Wipe cast iron skillet with a thin layer of the remaining oil. Add tuna steaks to the hot cooking surface and sear for 1 minute on each side. Remove tuna from heat. Meanwhile, slice avocado in half carefully scooping out the inside and dice the avocado into ½-inch cubes. Combine in a large bowl with chickpeas, onion, garlic and capers. In a small mixing bowl, combine all the ingredients for the salad dressing and whisk until well combined. Slice tuna into 1-by-¼-inch-thick strips and then add to the large bowl and toss gently with salad dressing. If needed, season with salt and pepper to taste, and then garnish with chopped cilantro. Chill until ready to serve. Pair this dish with winemaker Kathy Joseph’s Fiddlehead 2013 Happy Canyon Sauvignon Blanc, their signature, Loire-styled sauvignon blanc. This silky textured wine illustrates the beauty of the blend and tames this varietal into amazing elegance: one-third fermented in stainless steel for bright aromatics and zinginess, one-third fermented in new French oak barrels for layered textures and persistent flavors and the final third fermented in neutral French oak barrels to achieve marriage and grace. A chic, less herbal style with little hints of cloves, this wine is intentionally given a few years of bottle age prior to release to assure a seamless entrance onto your palate. Named for both its style and its AVA source, Happy Canyon of Santa Barbara, I hope you enjoy this very versatile crowd pleaser. John David Finley is a freelance writer and author of the cookbook "Sacred Meals from our Family Table," which features Santa Barbara County wines. He can be reached at sacredmeals@comcast.net. ​#releasetherose should be the new hashtag as Rosé season is here! This past week, Fiddlehead Cellars in Santa Ynez released the Fiddlehead Cellars 2017 Pink Fiddle, Fiddlestix Vineyard, Sta. Rita Hills, their first wine released in 2018 and is the Please The Palate pick of the week.I had the pleasure to taste the wine at Fiddlehead’s annual Pink Dinner Party, an event I look forward to each year as it falls within a few days of my birthday. We were dressed in pink, the winery was decorated in pink and we drink a lot of pink wine. I have been a fan of the Fiddlehead’s Rosé but the 2017 is a real standout! Due to overwhelming popular demand, we are repeating Fiddlehead Cellars Pinot Noir as the wine of the month for August, 2017. Kathy Joseph, the dynamic, owner/winemaker of Fiddlehead Cellars, lives in Davis, CA, and makes outstanding Pinot Noir from the Sta. Rita Hills appellation within Santa Barbara County. She also makes Pinot Noir from Oregon. Kathy is a hands-on person. She is meticulous about vineyard management and a perfectionist in her winemaking endeavors. Her Pinot Noir is always top notch, and her wines age beautifully. What more can we ask? The Fiddlehead Cellars Pinot Noir 2012 is a delicious wine. The Seven Twenty Eight refers to the mile marker 7.28 on Santa Rosa Road within the Sta. Rita Hills AVA. It is dark in color and yet soft, smooth, and satisfying on the palate, with a deft touch of acidity on the finish. Definitely a very, food-friendly wine. I must confess, I am looking forward to a glass of the 2012 Pinot Noir with dinner tonight. This is Pinot Noir at its best. For the entire month of August 2017 we are offering the Fiddlehead Cellars Pinot Noir 2012 at the reduced price of $60 per 750 ml bottle or $15 per glass. Don’t miss this opportunity to taste a world class Pinot Noir. Fiddlehead Cellars Winery is located in the “Wine Ghetto” in Lompoc, CA at 1597 East Chestnut Avenue. The tasting room is open only Friday through Sunday. Check with the winery web site for exact hours of operation. If you are in the Santa Barbara County wine region, a visit to the “Wine Ghetto” is a must. Sta. Rita Hills AVACreated in 2001, this AVA was known as Santa Rita Hills up until 2006, when the name was changed to Sta. Rita Hills because a Chilean wine producer called Viña Santa Rita objected to the original spelling. This is the westernmost AVA and has direct access to the cool ocean breeze. The hills act as narrow corridors and the breeze shoots through them, creating a cool climate in this wine-growing area. There are 20 cool-climate wine grapes planted here. The majority of the plantings are Pinot Noir and a good portion is Chardonnay. The sites in Sta. Rita Hills make a distinct difference in the flavor profiles of these two grapes. In Chardonnay, expect to find mineral, smoke, or flint characteristic. For Pinot Noir wines, most are rich and concentrated with red fruit accent. There tends to be more stem inclusion used in the vinification of Pinot Noir here, which can lend interesting flavors and tannins to the wines. Pinot Noirs, especially the single-vineyard bottlings, that bear this appellation are said to perform better after five years of barrel and bottle aging. Check out our wine travel guide to Santa Barbara Wine Country. At 3,729 square miles in size, Santa Barbara County offers unique topography and climatic diversity that give birth to six AVAs (American Viticultural Areas): Ballard Canyon, Happy Canyon, Los Olivos District, Santa Maria Valley, Sta. Rita Hills, and Santa Ynez Valley. The distance between the grape-growing area and the cooling effects of the Pacific Ocean is a key factor that shapes the characteristics of each AVA. The western areas are cooler, while the eastern reaches are warmer. The Santa Maria Valley lies to the north and the Santa Ynez Valley is further south. The grapes also show considerable vineyard-to-vineyard variation within each AVA. Chardonnay and Pinot Noir are two varieties that are synonymous with Santa Barbara County. However, the county is not all about that. Santa Barbara County is among the world’s most versatile grape-growing regions with a wide array of microclimates. Rhône varieties have taken hold of the land, and the climate in Santa Barbara may be the best place for Syrah in California. The warmer area of Happy Canyon is a proving ground that Bordeaux varieties can flourish in this region. Italian and Spanish varieties such as Cortese, Barbera, Malvasia, Mourvèdre, Nebbiolo, Sangiovese, and Tempranillo can also be found in the county. In this article, we spotlight 10 excellent examples of non-Chardonnay and non-Pinot Noir wines that are coming out of Santa Barbara County. Only 164 cases are produced. Barrel fermented with blocked malolactic fermentation. Aged in new French oak for 10 months on the less. Additional four years of bottle aging before release. This Sauvignon Blanc is rich, loud, and eclectic, yet with enough restraint to appease most wine lovers. White peach, pear, lemon, toast, and a host of savory notes give this wine its unique personality, but it is the mouthfeel that stands out the most—rich and smooth to the point of being custard-like, with the perfect acidity to provide freshness. This is a good interpretation of Bordeaux-styled Sauvignon Blanc and a real treat. The Spirit of Entrepreneurship Foundation's Spirit of Entrepreneurship Awards aim to recognize the contributions of outstanding women entrepreneurs in Santa Barbara County. 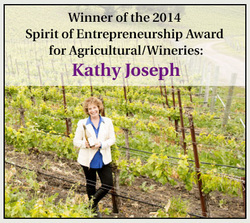 In May 2014, Kathy won the Spirit of Entrepreneurship Award for Agriculture and Wineries. 6 female Santa Barbara County winemakers in their video and article "Women of WIne". 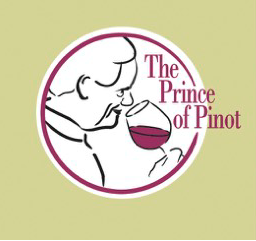 The Prince of Pinot, Rusty Gaffney, joined us for FiddleFest this year and wrote an in-depth review of Fiddlestix Vineyard and the wines that are produced from its grapes. Visit the PinotFile website and read the full article - you can enter the website for free and read everything ever written about Fiddlestix including all wine reviews. NBC’s In Wine Country made a visit to Santa Barbara County, with a feature on “The Wine Ghetto”. Also see if you can recognize Fiddlestix in this clip! Click HERE. The California Wine Institute and the California Travel & Tourism Commission partnered to promote the state's wine & cuisine offerings. Kathy Joseph was invited to make a debut as one of a select few wine representatives for this National campaign. Watch the video HERE! Destination Wine Country magazine came to visit Kathy and asked her to list the 10 things she simply cannot live without. Read them HERE. "If there's anyone in the Santa Ynez Valley with well-aligned left and right brains, it's Kathy Joseph. The founder, proprietor and self-proclaimed "grape-herder" of Fiddlehead Cellars exhibits a rare balance of free-spirited creativity and analytical zest…"
Wine Enthusiast had the following to say about the 2005 Lollapalooza Pinot Noir. Matt Kramer, in the October 15 edition of Wine Spectator, used Fiddlehead as an example of "Euro-beautiful" wine - the sort of wine that "give you a sense of not just goodness, but of a producer's commitment to his or her land" .